Sometimes I come across such great tutorials that I just have to share. 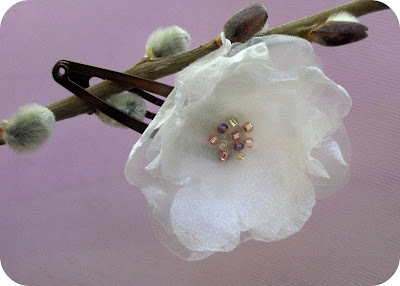 My recent find was a tutorial on how to make these organza flowers on the blog, Reese Dixon. I think it's just perfect to go with all those frilly Easter dresses. I made this hair clip by just hot gluing the flower directly to the clip. Perhaps I'll make a headband or pin as well. So many possibilities, so little time. These are truly beautiful! I wonder if they would work with other types of polyester? Ooh, I love these! I want to make some this weekend. Really pretty, will suit little girls so well. So pretty (& simple). 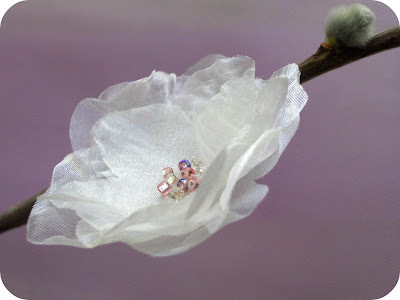 I love the flowers made out of the sheer fabric, I would imagine other fabric would work just as well, though. I love the flower! 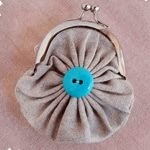 Though as simple as it may seem, the choice of flowers and clips determine a lot of the finished item. Pick the wrong flower and I'll end up like a parade dancer. Thanks for sharing! I saw the tutorial and I learned a lot. 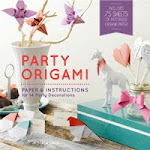 Making those crafts are really fun!. 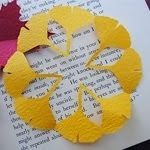 It is not easy to make those flowers, you really need more effort to come up with a beautiful one.